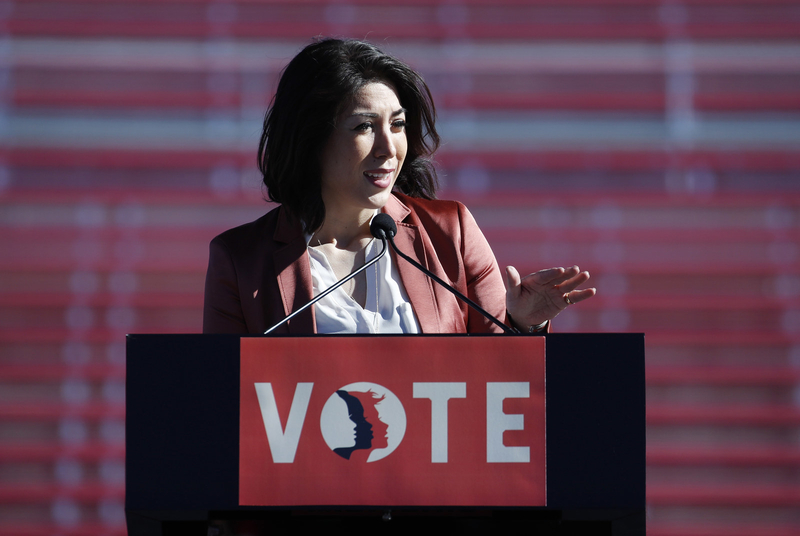 Could Paulette Jordan Be The First Native American Governor? In Idaho, any Democrat running is a long shot. But Paulette Jordan — who, if elected, would become the first Native American to serve as a governor — doesn’t mind the odds, and isn’t heeding calls to let an older, white, established candidate take her place. Shake Paulette Jordan’s hand and you likely won’t forget it. Her handshake is firm enough to be just shy of crushing, and she’s an expert at that disarming, straight-in-the-eye engagement. Jordan wants to make sure you know that she sees you. She’s tall — just under 6 feet — and her years on the basketball court compound the air of dominance with which she navigates a room. You could call it cocky. Or you could just use the word her supporters use: confident. On a blustery day in March, Jordan is in Boise, Idaho, for an evening fundraiser featuring local indie-rock darlings Built to Spill. She’s spent a fair amount of time in the state capital, both as a representative of her tribe, the Coeur d’Alene, and the tribes of the Northwest, but also as a member of the Idaho state legislature. But Boise isn’t home. That’s up north, in the Idaho Panhandle, just outside of Plummer, Idaho, where her family grows timothy hay and bluegrass. As a teen, Jordan’s parents or grandparents drove her an hour each way, every day, to go to school at Gonzaga Prep in Spokane, Washington — a city where another Democrat, Lisa Brown, is making national headlines running as a candidate in an area previously assumed to be a Republican stronghold. At 38, after serving just two terms as a state representative, Jordan is not a conventional gubernatorial candidate. Until she resigned to dedicate herself full-time to running for governor, she was the only left-leaning legislator from North Idaho to survive the 2016 Trump wave that took out even the most established Democrats in the area. She’s a progressive, but declines comparisons to Bernie Sanders; she’s a woman of color, running to become the US’s first Native American governor, in a state that is 82% white. In the Idaho house, she refused to toe the party line. She’s referred to state Rep. Heather Scott, a far-right legislator and favorite liberal enemy, as a friend. And while the bulk of the Idaho Democratic establishment has endorsed Jordan’s opponent, Boise school board member A.J. Balukoff, Jordan has earned the support of the progressive PAC Democracy for America, Planned Parenthood, Our Revolution, and was among the first five candidates endorsed on the national level by Indivisible. In January, Jordan was asked to speak at the national Women’s March gathering in Las Vegas; while there, she met and was endorsed by Cher. Left: Idaho state Rep. Paulette Jordan speaks during a Women's March rally Sunday, Jan. 21, 2018, in Las Vegas. 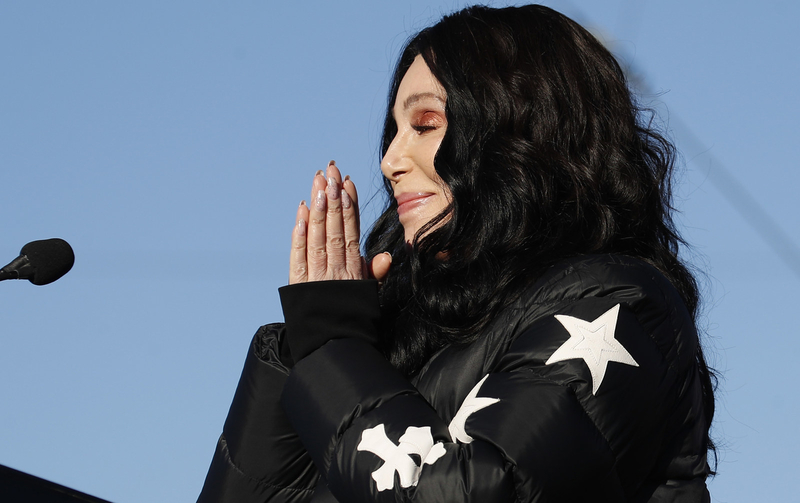 Right: Cher speaks during a Women's March rally in Las Vegas. Her candidacy has come to symbolize the breadth of the post-Trump wave of candidates who are energizing Democrats on both the local and national levels. When Mic ran a brief piece about Jordan in January, it stamped a picture of Jordan with “Young, Progressive, and Running.” At least 250,000 people shared or liked the piece on Facebook — several thousand more than live in all of North Idaho. Jordan has caught the national eye as a Native woman, and a progressive at that, who is vying to make history in a conservative state. In Idaho, however, she’s marketed herself as an independent, straight-talking, ranch-raised woman, in touch with the needs of people outside of urban areas and willing to work across the aisle to find solutions that work. But ahead of the May 15 primary, she still needs to persuade Idaho Democrats — many of whom remain convinced of their party’s impotency and irrelevance across the state — that the person they choose to run in a long-shot race against Republicans actually matters. After Roy Moore’s implosion in Alabama, there’s a good argument that Democrats should always try to run a candidate that a majority of voters, not just Democrats, could theoretically stomach voting for, no matter how certain their defeat might seem. And Jordan — who, unlike Balukoff, is not from Boise, and is not a millionaire — thinks she’s the only Democrat in this race who could actually pull out a win in a state that hasn’t had a Democrat in the governor’s office since 1995. Paulette Jordan during a podcast interview in Coeur d'Alene, Idaho. Jordan emphasizes the need she’s felt at various points in her life to return and connect with her people and her land. But she doesn’t romanticize life on the reservation, 524 square miles of rolling hills, evergreen forests, and ranch and farmland where her people were moved by order of President Grant in 1873 — now half the size of the territory originally granted by that treaty, and less than a tenth of the 3.5 million acres the Coeur d’Alene tribe once occupied across what is now Eastern Washington, North Idaho, and Western Montana. In 1983, one of the biggest silver mining operations in North America, located partially on the Coeur d’Alene Reservation, was designated a Superfund site — the largest in the country. In 1991, the Coeur d’Alene filed suit against the mining companies for failure to clean up the pollutants left in their wake, but it wasn’t until both the federal and state governments joined the suit that settlements were reached to clean up the hazardous waste that had slowly poisoned the land. Jordan operates squarely within the legacy of this history. She is the great-great-granddaughter of Chief Moses, of the Sinkiuse-Columbia, and Chief Kamiakin, of the Yakamas, both of whom fought settler expansion before being forced, along with their people, onto reservations. Her adopted grandfather, Felix Aripa, was born on the reservation in 1923, attended Gonzaga University, and, until his death in 2016, was one of the tribe’s last Native speakers, with a deep knowledge of the Coeur d’Alene traditional territory and place names. In 1996, he served as an expert witness in the tribe’s lawsuit to regain its traditional fishing grounds on part of Lake Coeur d’Alene. “Even my mom was not super happy,” she recalled. “But I really felt like I needed to go back and connect with my tribal roots and the land. Your community can really revitalize you.” And the experiences that followed prepared her for a different sort of candidacy than what would’ve happened if she’d gone to law school, or stayed in Seattle, or gone straight to lobbying in DC. Her first job was as a “lake ambassador” for the Coeur d’Alene Basin Commission, traveling to communities on and off the reservation to coordinate Superfund cleanup plans. Jordan’s job was to communicate the plan — which included shaving off the top layer of soil in many of the affected places — to those who opposed it. One of her first stops was St. Maries, a once-thriving timber town on the edge of the Coeur d’Alene Reservation. Tension has long simmered between the Coeur d’Alene tribe and the townspeople, the vast majority of whom are white; in the early 2000s, many residents were vehemently opposed to both the Superfund designation and cleanup efforts, which they viewed as overly invasive industry killers. Jordan’s takeaway from that exchange became a guiding principle: You have to make direct contact, even with, especially with, people you disagree with. “You don’t have to be partisan, you’re not trying to sell anything, you’re just listening, and you’re trying to hear them out,” she told me — even with white supremacists, who maintain an active presence in Idaho and whose ideologies filter down, diluted to different degrees, in various areas of the state. It’s a difficult message to prescribe to others. But it’s become Jordan’s guiding philosophy — particularly when it comes to Idaho politics. She recalls how, after meeting with a room of ranchers, two of them came up to her — one Republican, the other independent — and said, “Well, I don’t like what you said about the organic stuff. But I like what you said about this other thing.” They were surprised someone like her — a Democrat and a Native — came from a ranching family. Still, this sometimes very literal embrace of the right can be hard for some Democrats to stomach. At the Women’s March earlier this year, Jordan attracted attention when she introduced Scott — the far-right “liberty legislator” known for her defense of the Confederate Flag — as her “friend.” But working with people like Scott is the only way for Jordan to get elected in Idaho, whether to the state legislature or, today, in her run for the governor’s office. Jordan’s political career started in 2009 when her grandfather approached the tribal council: “This young woman is the future of our people,” he said. When she later won her race, the rest of the council was in their sixties and seventies; Jordan, at this point, was in her late twenties. Through her position on the council, she became a board member with the Affiliated Tribes of Northwest Indians and the Northwest Indian Gaming Association. She began traveling regularly to Boise for gatherings, receptions, and sit-downs, gradually becoming the public, active speaker for the tribe. In 2012, Idaho went through legislative redistricting, cutting off a swath of Jordan’s home district where conservative candidates had dominated legislative races. What remained was what Jordan calls a “shotgun marriage” of a district: home to the reservation, St. Maries; a bunch of rural farmland; and Moscow, Idaho, where the University of Idaho and the deeply conservative Christ Church vie to offset each others’ political leanings. Jordan filed late to run, leaving her with just eight months to campaign. But she knocked on doors and put in the legwork. “They say a true chief will always take the time to talk to everyone in the community,” Jordan told me. “You don’t leave one person untouched: man, woman, or child.” In an odd turn, the campaign briefly employed Rachel Dolezal, then-director of the North Idaho Human Rights Education Institute, at the recommendation of a senior elected official from the Idaho Democratic Party. (Campaign finance records indicate Dolezal was paid $5,500 for her services.) In the end, Jordan lost the race to Cindy Agidius — who, in addition to being married to the longtime mayor of Moscow, had spent years working for Idaho’s then-governor — by just 122 votes. Not bad, in other words, for a 32-year-old first-time candidate. Over the next two years, Jordan accepted a position as finance chair for the National Indian Gaming Association and geared up to run again, putting in face time with various veterans and cultural groups off the reservation, in the southern end of the district. In 2014, she faced Agidius again; this time, she beat her by two points and took her place as the sole Native American in the Idaho legislature. When Jordan ran for reelection in 2016, she was the only Democrat north of Boise to survive the Republican wave that carried Trump to the White House. Jordan explains her votes, including several where she was the only dissenting vote in the entire House, as acts of true leadership. She sees politicians as either leaders or followers: “Leaders” vote and act in a way that reflects the needs of their constituents back home, with whom they remain deeply connected. “Followers” are beholden to groups like the Idaho Freedom Foundation (which grades each vote according to its adherence to their idea of conservative values), who bow to groupthink, even when it betrays what they believe is best for their own district. Paulette Jordan prepares to saddle up at her uncle's ranch in Worley, Idaho. Many established Democrats consider Jordan a wild card: untested and unknown. Several referred to her as a “really beautiful” but “very young” woman who, if elected, would never be able to wrangle a recalcitrant Republican-dominated legislature. Which helps explain why none of the Democratic establishment has endorsed her — a scenario that might ultimately play to her favor, as she underlines her status as an outsider, unbeholden to big-party influence. Like so many other Idahoans, Balukoff is a transplant. He moved to Boise in the early '80s to build a financial services firm, a string of health clubs, and eventually help develop the swanky Grove Hotel and hockey arena in the heart of downtown, home to the Idaho Steelheads hockey team, which he co-owns. He grew up in California — and no state receives as much scorn in Idaho than California. Criticism that he’s “out of touch” has clung to him since he became a statewide figure in 2014, when he first ran for governor against Republican incumbent Butch Otter, spending more than $3 million of his own money. He became known for his bow ties, which he defended as “more festive”; attack ads painted him as “Liberal A.J.,” a jab that reportedly deeply wounded Balukoff, who voted for Mitt Romney in 2013. The chance to support a history-making candidate is an effective hook, and one that Jordan’s own campaign has embraced in its online rhetoric. Sometimes, however, it can elide, or displace, her greater policy ideas. When asked what they liked about Jordan, attendees at her Boise fundraiser responded with variations on, “Wouldn’t it be incredible for Idaho to have a female governor?” and “I like what she stands for.” Most also identified as progressives and early supporters of Bernie Sanders, who won the Idaho Democratic caucus with 78% of the votes. The election will likely come down to which candidate is energizing voters, which candidate makes them want to show up on a Tuesday in May. In truth, there are few substantive policy differences between the two candidates. Jordan’s against arming teachers in the classrooms; Balukoff believes it should be decided on a district-by-district basis. He’s against charter schools; she believes they can help students whose schools haven’t “adequately” served them. He hedges on calls to legalize marijuana; she’s unequivocally for it. But they’d both expand Medicaid, both aim to protect public lands, and both are fed up with the proliferation of minimum-wage jobs. To put it simply, they’re both Democrats in Mountain West states. Yet in a year where so much energy is not just on Democratic candidates, but women candidates in general, it’s easy to see why voters are attracted to Jordan. As is the case in so many primaries, the election will likely come down to which candidate is energizing voters, which candidate makes them want to show up on a Tuesday in May — and, specific to Idaho, which one will make Democrats who’ve changed their party membership (so as to vote in closed Republican primaries and select the “least wackadoodle” candidate) come home to vote in the (open) Democratic primary. Paulette Jordan at her uncle's ranch in Worley, Idaho. Could Jordan win in a general election? Probably not. But does it matter, if she’s galvanized voters in a state where the political outcome has long felt like a foregone conclusion? Mark Trahant, a longtime journalist, professor, and member of Idaho’s Shoshone-Bannock tribe, recently took over as editor of Indian Country Today, where he’s been following the surge of Native candidates across the country closely. “Jordan is building on a rich heritage that’s really unique to Idaho,” Trahant told me. Joe Gerry, a member of the Coeur d’Alene, was a member of the Idaho Senate and ran for US Senate in 1960 and 1962 — the first in the nation. Twenty-five years later, Jeanne Givens, Gerry’s niece, ran twice for the US House. In 1996, Larry Echo Hawk — who’d served as Idaho’s attorney general under then–Democratic governor Cecil Andrus — ran for governor. If Jordan beats Balukoff and proceeds to the general election, her chances will largely depend on who emerges from the catfight of the three-way Republican primary, in which Lt. Gov. Brad Little (a millionaire rancher endorsed by much of the GOP establishment, hobbled by a dearth of charisma) is facing off against Rep. Raúl Labrador (a three-term congressman and firebrand popular with the far right) and Tommy Ahlquist (a physician turned developer with a massive war chest who’s countered allegations that he’s a RINO — Republican in Name Only — by swinging far to the right). Jordan prides herself on her ability to connect with voters across the political spectrum in those small towns. But connection is not the same thing as getting a vote. The task ahead of her is massive: She not only needs to meet all those people but win them over. She’ll need to surmount existing prejudice against Natives that runs rampant in many of those small districts. She’ll need to mobilize the Democratic vote like no candidate in recent history, simultaneously appealing to progressives in Boise and the scattered blue dots across the state. And to get those voters to the polls, she’ll need to convince them that their vote could affect change.